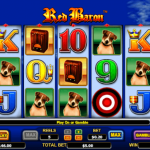 Red Baron is a video slot game from Aristocrat that celebrates the life of the well known World War I pilot. All the symbols are somehow related to the World War theme and the sound effects really complement the game. The reels are set on a blue clear sky with some clouds and it indicates that we will have a peaceful flight. The wild symbol in this game appears on the third reel only, but what makes it so special is that it can stand in for the scatter as well. The scatter which is the black, red and white target appears on the second, third and the fourth reel. If you manage to land 3 scatter symbols you will activate the feature and receive 15 free spins. But during the feature you will need to guess how many planes will appear on the reels. In the first Mission, 4 planes will bring x10 multiplier, in second mission, 8 planes will bring x15 multiplier, in the third mission, 12 planes will bring x25 multiplier, in the fourth mission 16 planes will bring x60 multiplier, in the fifth mission, 20 planes will bring x140 multiplier. 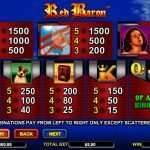 Red Baron is a basic video slot game from Aristocrat, but yet entertaining. We like the graphics of the game and everyone who enjoys war games will appreciate what the software provider has done in this game. The best part in Red Baron is the feature. It is somehow different than what we are used to see in other games and it can also be very lucrative. The betting options are also worth mentioning here because they are made in that way that every low to medium roller can find the right bet size for them. 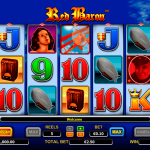 For another great engaging game you should consider playing Queen Of The Nile II a 5 reel slot by Aristocrat.